This is just the beginning of the VR fitness market. Black Box VR, a pioneer in virtual reality fitness, has been declared BEST STARTUP of CES 2018 for its innovative resistance-based virtual reality fitness experience. The award was presented in Las Vegas by Engadget, the Official Awards Partner of the International Consumer Electronics Show, hand-selected by their judges from an estimated total of over 4,500 exhibitors at the conference. The team had also opened the show as an official 2018 CES Innovation Award Honoree, and was present at the Sands Expo Hall debuting their system to the public for the first time. With plans to open their first boutique gym in San Francisco later in 2018, the Black Box VR studio has developed the world’s first fully automated cable resistance machine that integrates virtual reality hardware and original virtual eSport software powered by HTC Vive. Black Box VR users get an intense, time-dilated, custom workout while immersed in challenging, gamified and competitive virtual reality fitness experiences that redefine eSports into physically active vSports. 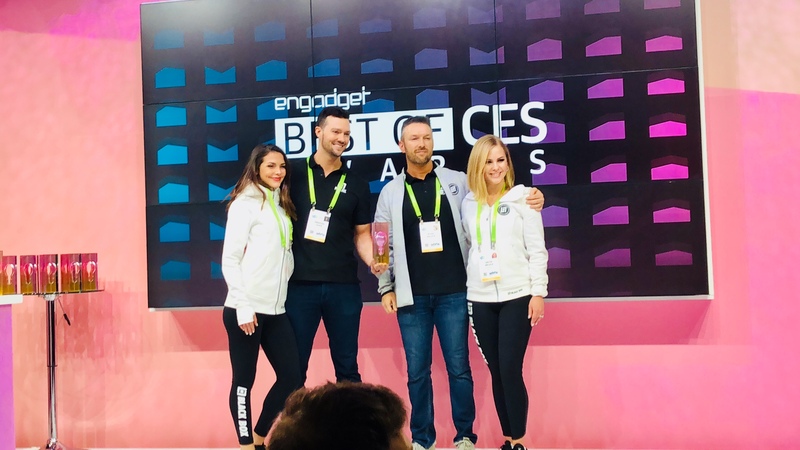 "We couldn't be more proud to receive such a prestigious honor from the International Consumer Electronics Show and their official partners at Engadget," said Ryan DeLuca, CEO and Co-Founder. "The worlds of fitness and immersive VR are finally coming together to help people reach their goals. This award helps us bring awareness to this revolutionary technology." Preston Lewis, Co-Founder and CCO added, "Over the past 18 months we've put in an enormous amount of work to strategically combine science-backed fitness programs with the addictive qualities of gaming, immersive technologies, and innovative hardware to transform lives for the better. This award is a testament to the hard work put forth by our talented, passionate, and multi-faceted team, and we couldn't be more thankful for this amazing recognition." In their coverage of the show, Engadget stated, "Black Box has big plans to change the fitness industry AND gaming while they're at it." Black Box VR was also nominated for Best Digital Health and Fitness Product, Best Sports Tech, and People's Choice. Upon their decision to award Black Box VR as the winner of Best Startup, Engadget's Senior Reporter Jess Conditt said, "Black Box VR is building the gym of the future. Using the HTC Vive, motion-tracking controllers and specially designed workout equipment, Black Box turns exercise into a video game. The plan is to set up a boutique gym in San Francisco this year, where members can strap into a game, work out and attempt to land on the local leader-boards. This is just the beginning of the VR fitness market." Founded by fitness fanatics Ryan DeLuca and Preston Lewis, the Black Box VR team spent years building Bodybuilding.com into the largest online supplement retailer in the world with nearly $500m in annual sales. With the collaboration of many talented individuals, they created some of the world’s most recognized supplement brands, developed chart-topping fitness mobile applications, were honored for their award-winning health and fitness campaigns, and created the world’s largest online fitness social network with over 3m members while always holding true to the mission of changing people’s lives. In 2016 Preston and Ryan decided to start their new venture, Black Box VR, with a mission to disrupt the fitness industry once again by creating innovative products and experiences that create lasting change in people’s lives. After trying virtual reality for the first time, Ryan and Preston knew they were experiencing a magically immersive technology that, if paired with resistance training, gaming principles and high intensity cardio, will be the winning combination for people trying to reach their health & fitness goals. Black Box VR is redefining fitness as we know it. Founded in early 2016, health & fitness industry veterans Preston Lewis & Ryan DeLuca decided something in the industry needed to change. Even after successfully building Bodybuilding.com to $500M in revenue and creating some of the world’s most popular fitness apps and tools, they still saw the same glaring problem again and again: people hate working out and lack consistency. After experiencing the immersive power of VR, Preston and Ryan knew this technology, when paired with resistance training and addictive game principles, would be the paradigm shift the industry needed to finally keep people on track. With this, the vision for Black Box was born. Black Box applies the addictive qualities of gaming and immersive technologies to working out, which will revolutionize the fitness industry. 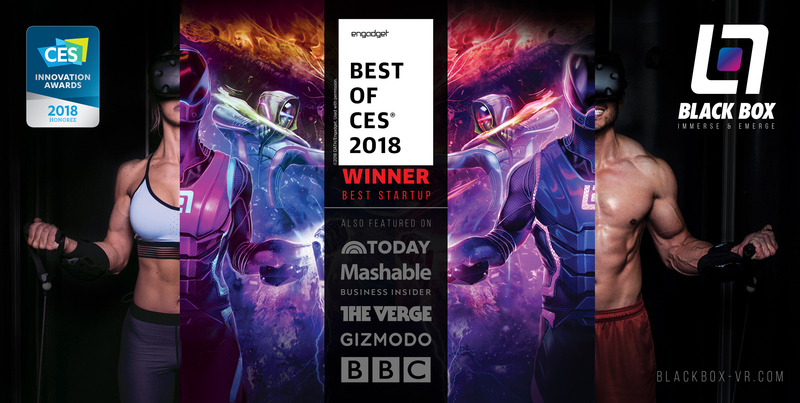 In Januray of 2018, the team was awarded the honor of 'BEST STARTUP' of CES by Engadget, the Official Awards Partner of the International Consumer Electronics Show. VIVE is a first-of-its-kind virtual reality platform, built and optimized for room-scale VR and true-to-life interactions. Delivering on the promise of VR with game-changing technology and best-in-class content, Vive has created the strongest ecosystem for VR hardware and software, bringing VR to consumers, developers and enterprises alike. The VIVE ecosystem is built around the best and most comprehensive VR hardware in market, supported by VIVE X, a $100 million accelerator for VR and related technology start-ups; VIVEPORT, a global platform, app store and subscription service for VR that operates in more than 30 countries; and VIVE Studios, its VR content development and publishing initiative.